StudioLine Photo Basic 4 contains many of the same functions as StudioLine Photo Classic 4. It supports dual-monitor video cards, and is regularly updated with Smart-Update. 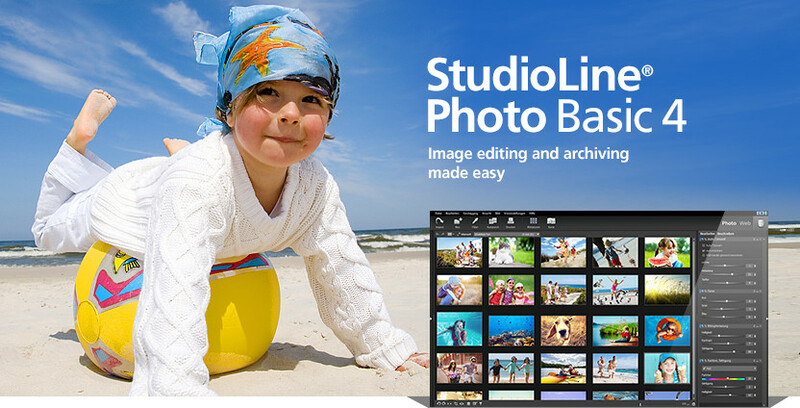 StudioLine Photo Basic is the completely free starter package for personal use! Many image filters, such as white balance, exposure correction, unsharp mask, are available to enhance your images. All editing steps are non-destructive because only individual tool settings are stored in a database. This way, the original image remains always intact. The Load Assistant guides you with the importing of images to the image archive from various media, including Cameras, USB flash drives, CD/DVD and hard disks. Previously imported files are automatically deselected to avoid duplication. Present your images in an attractive slide show on your PC monitor or television. Double-click a thumbnail to open the image in the Image Viewer. Zoom to any magnification level and quickly browse between different images. For specialized effects or edits, StudioLine lets you open your image directly in your favorite external programs. The changes will be saved back to the StudioLine image archive. Protect yourself against data loss with StudioLine's built-in CD/DVD functions.